The pass-through exemption for LLCs, Sub-S corps, partnerships and proprietors helped add over 18,000 new jobs in 2015 while all other private employers had small declines. New U.S. Census data shows employment at pass-through entities increased by almost 4 percent while the other major category – C-corps – declined by a half percent. Kansas was far behind the national average prior to the pass-through exemption being implemented but last year trailed by just three-hundredths of a percentage point. Jobs gains cannot be fully attributed to the pass-through exemption but there should be no question that it’s a major factor. Most private entity types have seen little growth since 2012 but employment at the pass-through entities shot up by 12.7 percent. Kansas is also performing much better against the national average since the exemption went into place, going from 52 percent of the national average (2.4 percent vs. 4.6 percent) prior but is since at 92 percent of the national average (12.7 percent vs. 13.9 percent). And with the addition of 54,424 jobs since 2013, pass-through entities have accounted for 98 percent of all private sector job gains. 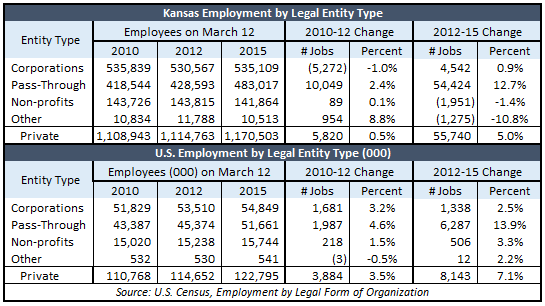 As evidence mounts that the exemption is driving most job growth in Kansas, legislators want to kill it off and leave all other tax preferences and subsidies in place. Citizens have been repeatedly told that the pass-through exemption doesn’t work and isn’t fair, so many citizens believe the exemption should be repealed. KPI first released research on employment by Legal Form of Organization almost six months ago, showing then that pass-through entities accounted for 82 percent of job gains in the first two years. But with rare exception, media refused to share the news with citizens so it’s not surprising that most citizens don’t know the truth. There is a legitimate fairness issue regarding the exemption, but most legislators won’t address the many other fairness issues in the tax code. Preferential tax treatment for government employees, subsidies to certain businesses, sales and property tax exemptions and other fairness issues are ignored while the one program that’s working is targeted for extinction. The economics are clear but as usual, politics prevail in Topeka. Economist Thomas Sowell said, “No one will really understand politics until they understand that politicians are not trying to solve our problems. They are trying to solve their own problems — of which getting elected and re-elected are No. 1 and No. 2. Whatever is No. 3 is far behind”.